Who is the puppet and who is the master? “I talk and negotiate with Riga, with Oleg Solodov and others. Even the money that we [the City of Tallinn] pay goes to Riga, not to Tallinn”, says Lev Vaino, referring to the 425,000 euro contract for the production and transmission of three different shows on Pervõi Baltiiski Kanal – “Our capital” (“Наша столица”), “Good morning Tallinn” (“Доброе утро, Таллинн!”) and “Russian question” (Русский вопрос”). The City of Tallinn is a trusted client of PBK and almost the same amount of money (425,382 euro) was paid again in 2012 for PBK to continue producing the same programmes. 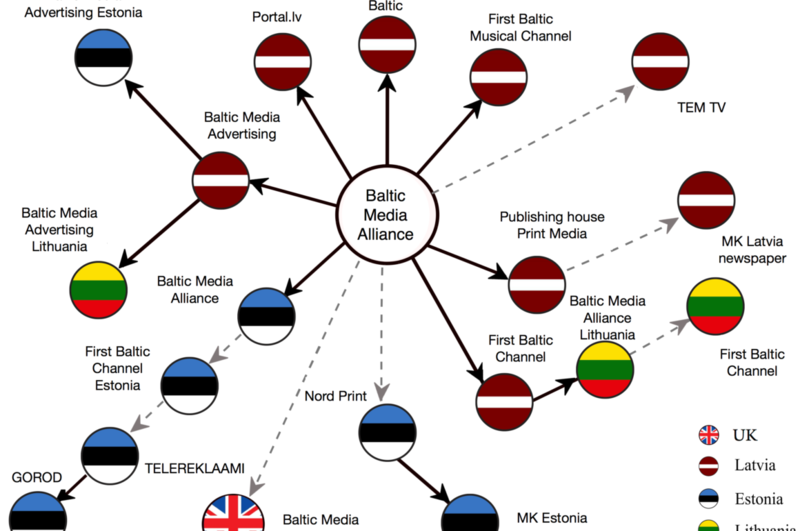 Re:Baltica offers the interactive map. To see detailed information hover mouse over any link in the map. To explore the map in full size, click here – BMA map. Lev Vaino is a member of the Estonian Centre Party which controls Tallinn. He is the man in charge of the media for the City of Tallinn, and is employed to coordinate the portrayal of the city’s activities in the Russian language media. To a random bystander he appears to be a typical public servant: he is precise, talks quietly but clearly and doesn’t reveal his emotions to any degree. Vaino has been in politics for a long time although most people have never even heard his name. He doesn’t have a shiny political record, having mostly been in low-profile positions. But this is all deceptive. hosts) are coordinated directly with Solodov. His role as the intermediary between the City of Tallinn and Pervõi Baltiiski Kanal (PBK) makes him one of the most influential people in Estonia’s Russian language politics. His past, although generally low-key, has a few more colourful spots. Before joining the Estonian Centre Party, he was a member of the Estonian Constitutional Party and was quite strangely, for a period, a member of both parties at the same time. It should be pointed out that the Constitutional Party, though small and marginal, was one of the most radical parties on the Estonian political landscape. 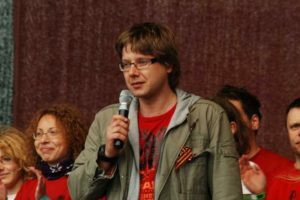 Party leader Andrei Zarenkov was one of the activists in the Bronze Night riots in Tallinn in 2007. Zarenkov and his party also received directly support from Russian officials, including Russia’s ambassador in Estonia at the time, who wrote letters to various Estonian business people requesting support for Zarenkov. Lev Vaino also has a family connection to PBK. He is an uncle of Aleksander Tsaplogin, a well known, and also one of the most hostile and anti-Estonian media personalities in the local Russian speaking community. Tsaplogin is the anchorman for one the PBK programmes paid for by the City of Tallinn – Russkij Vopros (Russian Question). It’s not hard to find people, even among the Russian community, who dislike Tsaplogin’s black and white, aggressive and inflammatory style. In fact, PBK´s local Estonian programme consists of only four shows, the abovementioned three, plus the local news programme, “Новости” (Time). 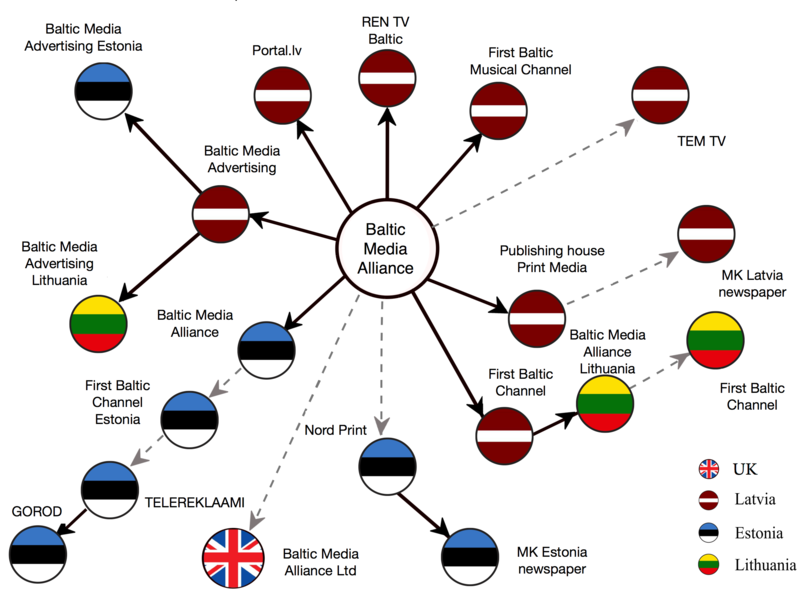 This programme too is directly linked with the Estonian Centre Party. “Новости” is produced for PBK by a company called Maurum, which has at the same time been a long time advertising partner of the Estonian Centre Party. In addition, the owners of Maurum have personal ties to the Centre Party. According to Lev Vaino, Tallinn’s media chief, all general concepts – issues discussed on PBK programmes, formats and anchors – relating to the shows paid for by the City of Tallinn, have to be confirmed with Oleg Solodov in Riga. “In fact that was the reason why I resigned from MK-Estonia,” says Pavel Ivanov, former editor-in-chief of MK-Estonia newspaper (a sister company of PBK). He states that all important decisions were made in Riga, and too much was being dictated. Ivanov does at the same time describe Solodov as smart and a quick decision maker. Local people in the Estonian office are responsible for the everyday business. Irina Kozorenko is the head of Estonian BMA, but she is not the only person with whom Solodov communicates. “Between the two of them” is Margus Merima. For almost 10 years he was the head of PBK Estonia. He resigned in 2009 due to health reasons. But, Merima hasn’t disappeared from the picture completely. His official title today is “advisor to PBK“. Merima attempts to describe PBK’s political stance in Estonia in neutral terms. However, he admits that the Centre Party has a high representation on PBK´s shows. He is also quite frank about possible influence from the Centre Party (which controls Tallinn) on the content of programmes paid for by the city. “And yes, Tallinn is paying for it …but you know the old saying – he who pays the piper, calls the tune,” says Merima. In general, Merima says that the Centre Party’s representation on PBK is not as a result of some grand scheme or strategic decision. It “just happened” and PBK isn’t interested in politics. It’s “just business”. Merima himself has publicly stated that he does not have political interests. He is not a member of any political party and he has not been a candidate in any elections. Among Merima’s Facebook friends, the majority are from the advertising world or involved in dog breeding (Merima is an avid dog breeder and his wife is the chairman of the Estonian Retriever Society). The only politician among Merima’s friends is Riga’s Mayor – Nils Usakovs, the chairman of the Harmony Centre Party in Latvia, and a former news producer at PBK Latvia. Nevertheless, Merima’s “I’m not interested in politics” attitude is not quite honest. His businesses, at least, have been closely connected with politics for years. In addition to his long-term previous post with PBK, Merima has another business. 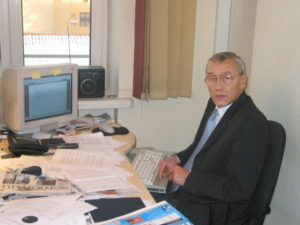 He is the chief of the Telereklaami OU company which publishes local Russian language newspapers in Estonia. The official owner of Telereklaami is an offshore company, but the business is run from the same office as PBK in Estonia. One business is the Gorod newspaper in the city of Narva, which is the third largest city in Estonia. Its population is almost entirely Russian speaking and strongly supports the Centre Party. 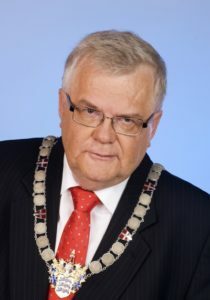 Gorod has received money from the City of Narva, it supports the local administration (ruled by the Centre Party, obviously) and has been particularly favourable to Mihhail Stalnuhhin, former Chairman of the City Council of Narva, and now a Member of Parliament from the ranks of the Centre Party. Stalnuhhin is one of the most influential Centre Party politicians after Edgar Savisaar, as well as being one of the most radical. Stalnuhhin is also one of the favourite guests on PBK programmes. He has quite public links and contacts with various Russian radicals, people like Modest Kolerov, Dmitrij Jermolaev and Maksim Reva – who have been involved in hostilities against the Baltic States for a long time. Stalnuhhin does not even try to hide these relationships. In October 2011, Stalnuhhin took part in a conference in St. Petersburg of the Russian Compatriots in the Baltic States. (Международного Балтийского форума соотечественников.) There were persons in the Estonian delegation who were involved in organizing the 2007 Bronze Night riots in Tallinn (Andrei Zarenkov, Dmitri Klenski and Maksim Reva). One of them, Reva, blamed the Russian Embassy in Estonia for being too friendly towards the Republic of Estonia in 2010. His statement was published on the Regnum.ru. news portal. According to the Estonian Secret Service, the published statement was prepared with the help of Dmitri Yermolajev. 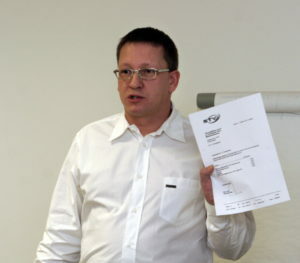 In 2005, the Latvian Security Service declared Yermolajev to be an officer of Russia’s espionage services, and has not been allowed to enter Latvia since. Telereklaami for a long time also published another controversial newspaper, Panorama in Kohtla-Järve, the fifth largest city in Estonia. Merima takes care of the publishing side, but Panorama’s entire content, its stories, news and articles are paid for by a company called Lites LT. Lites is owned by Kohtla-Järve businessman Nikolai Ossipenko, who is closely connected with the local city government and the Centre Party. In short, the Gorod and Panorama newspapers support the Centre Party in the same way as PBK supports the Centre Party on television. Let’s make our own Ždanoka! Connections between the PBK and the Centre Party, as well as connections between the Centre Party and various Russian radicals are clear. But how coordinated are these activities and this cooperation? In Latvia, the situation is probably simpler. Nils Usakovs, Mayor of Riga and head of the Harmony Centre Party is himself a former employee of PBK. He knows and has personal connections with PBK personnel. In Estonia, Edgar Savisaar, head of the Centre Party, does not have these kinds of personal connections with the local PBK office. In Estonia, two names usually get mentioned when people talk about PBK and the Centre Party. The first is Vladimir Velman, who has been a Member of Parliament since 1995 (obviously with the Centre Party). Velman is also a former journalist and one of the favourite guests on PBK shows. If nothing else, then his good personal and friendly relations with PBK people are helping to shape the relationship between the TV channel and the party. But most people point their fingers in another direction – to the abovementioned Lev Vaino, media chief of Tallinn and adviser to Edgar Savisaar. Oleg Samorodnij, for instance, says that if any one person can be called the coordinator between PBK and the Centre Party, then it’s Lev Vaino. Vaino himself admits that his responsibility as the media chief of Tallinn involves managing relationships with the Russian language media and particularly with PBK. But adds Vaino, this does not mean that he dictates how PBK has to praise and support the Centre Party and the Tallinn administration. “Of course we discuss general things, but we don’t dictate anything,” says Vaino. Some people are not as reserved as Vaino. A PBK employee described how Vaino has gained more and more control over the years and now quite directly dictates how PBK’s news programme is to operate and what it shows. Another former BMA employee adds that during election campaigns, every issue of the MK-Estonia newspaper had to first be sent to Lev Vaino for pre-printing approval. “I don’t believe that decisions are made by PBK Estonia and I don’t believe that decisions are made by BMA in Riga either. I think that decisions are being made in Moscow,” says Oleg Samorodnij. It’s quite difficult to prove this statement, but there are a few indirect signs supporting this. The Centre Party’s close links to Moscow have been apparent for a while now. The most prominent example is Edgar Savisaar himself. At the end of 2010, the Estonian Secret Service (Kaitsepolitsei) named Savisaar as an “agent” of Russia, when they discovered that Savisaar had asked Moscow for money for his party. Another example is from 2011, when the ТВ Центр TV station showed a positive propaganda film about Edgar Savisaar shortly before the parliamentary elections in Estonia. People are able to watch ТВ Центр via satellite and cable in Estonia, but the channel itself is owned by Moscow’s city administration. It is based in Moscow, doesn’t have an office in Estonia and doesn’t have a local program for Estonia’s Russian speakers either. To show a propaganda film in Moscow, about an Estonian politician, especially just before the elections is a weird decision. One interpretation of this is the conclusion that somebody close to Moscow’s city administration (the owners of ТВ Центр) was interested in making a decision about this kind of propaganda. It is not the first time Moscow’s city administration has been involved in Baltic politics. In 2009, prior to the European Parliament elections, efforts were made to find a possible candidate to represent the Russian speaking population in Estonia. “Lets make our own Ždanoka” – went the slogan. Moscow’s choice was Aleksei Semjonov, chairman of the Information Centre of Human Rights in Tallinn, an organization in Estonia, which is called a tool of Russian propaganda. 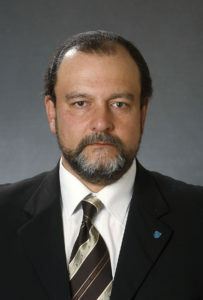 Georgi Muradov, head of the Moscow administration’s Department of International Relations, flew to Tallinn and offered financial support for Semjonov’s candidacy. Muradov made it quite clear: Russian politicians in Estonia should stop quarrelling amongst themselves and support Semjonov as the sole candidate. Well, the quarrelling didn’t stop and Semjonov backed off. Semjonov’s political career did not end though, as last year he joined Estonia’s Centre Party. But it seems that this triangle (the Centre Party – PBK – the interests of Moscow/Russian radicals) is not strictly hierarchically organized. There are relationships which are sometimes based on shared political interests, sometimes based on business, while some are just based on personal and family connections. What seems clear is a trend for the Centre Party to become more radical through this process. It is accepting more people, who aren’t even trying to hide these connections, into the party’s ranks. And to them, PBK is a very useful for getting publicity and power. But, for PBK it’s only one thing – money. It’s “just business”.